In 2012, author Arno Kopecky sailed through British Columbia’s Great Bear Rainforest on a 41-foot boat named Foxy. Along with the elusive Ilja Herb, they explored the incredible biodiversity of the region. The region where the proposed Northern Gateway Pipeline will travel. 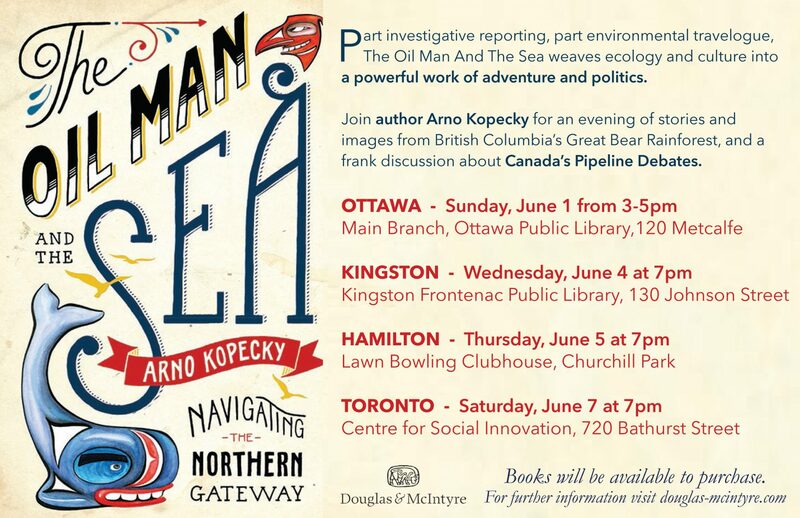 Kopecky’s award-winning book The Oil Man and the Sea, is about that journey. Kopecky will be speaking about the book and his experiences in Ontario over the next couple of weeks. If you’re in Ottawa, Kingston, Hamilton or Toronto during Kopecky’s visit, you owe it to yourself to check out Ilja’s incredible images and Kopecky’s passionate plea to stop the Northern Gateway Pipeline.